If your home library is elsewhere in BC, and you’re visiting McBride or the LSRR, BC OneCard patrons may borrow up to 5 items at one time including books, magazines, audiovisual items, audio/music tapes and CD’s. 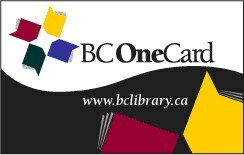 If we are your home library and you’re visiting another library in BC, take your card to front desk staff and ask for a BC OneCard. Borrow items at any library in BC and return them in McBride, for free!